Guard Hannah Fox ‘20 has excelled in her second campaign, averaging 12 points per game and shooting 40 percent from behind the three point line. 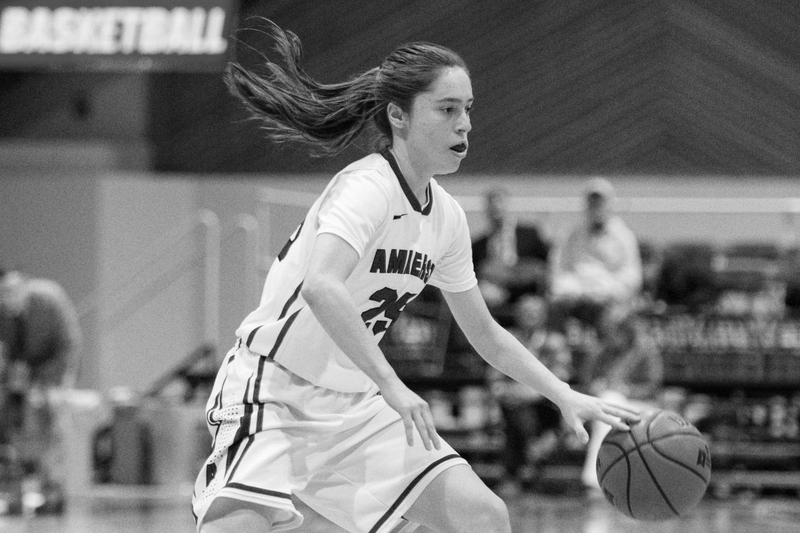 The Amherst women’s basketball team took down NESCAC rivals Colby and previously-undefeated Bowdoin in a pair of exciting victories this past Friday and Saturday to remain unbeaten this 2017-18 season. A rambunctious home crowd in LeFrak Gymnasium Saturday afternoon against the Polar Bears helped make the improvement to 20-0 an especially exciting ordeal. Amherst was first able to hold off the Mules during a Friday evening matchup to move to 5-0 in NESCAC play. Senior Jackie Nagle had a stellar performance off the bench, tallying 12 points and nine rebounds, allowing the Mammoths to finally separate from Colby after leading by just one point at half-time. Hannah Fox ’20 and senior captain Hannah Hackley both dished out four assists in the win, with Fox putting up nine points and Hackley adding eight. The low-scoring game stayed competitive, but the Mammoths were always one step ahead of the Mules, who looked flustered offensively and were consitently outmuscled by Nagle and junior Emma McCarthy under the hoop. By the time the final buzzer went off, Amherst had extended the lead to nine to defeat Colby 46-37. Not 24 hours later, Amherst was back in LeFrak to host the similarly undefeated Bowdoin Polar Bears. Amherst fought off some nerves in the first quarter, struggling offensively against a tight-knit Bowdoin defense and a dwindling shot clock. Bowdoin led 11-9 after the first quarter and held a 10-7 rebound advantage at the start of the second quarter. However, Amherst struck back to make it a one point game with 6:50 left in the second quarter thanks to a three-pointer by McCarthy, before finally taking the lead after a basket from sophomore Cam Hendricks. As the whistle blew to end the first half, the Mammoths found themselves clinging to a slim two-point lead. The third and fourth quarters were characterized by scrappy play, with both teams trading baskets and fouls and numerous players diving to keep the ball in bounds. Both teams found sucess in the paint as well — more than half of Bowdoin’s and Amherst’s points came from down low. Fox and McCarthy both put up an impressive 14 points, with seven of Fox’s coming in the fourth quarter, helping to gain the edge in the final minutes. It was McCarthy who clinched the win with four seconds to play by draining both free throws to give the Mammoths an insurmountable 49-45 lead, which doubled as the final score. Fox, who was holding the ball when the final buzzer went off, sped back to the home bench to celebrate with the rest of her team, and the student section piled onto the court. Amherst’s next matchup is another big home game on Friday night against Tufts, a team out for blood after suffering three losses to the Mammoths, most notably in last year’s NCAA National Championship game, which Amherst dominated in, 52-29. The game will take place in LeFrak at 7 p.m.